Sudden Strike 4: Africa – Desert War features two new mini campaigns with six new single player missions from the North African campaign of World War 2. In the Axis campaign, start the Italian advance on Egypt to take the city of Sidi Barrani, besiege the city of Tobruk and take over its harbour, as well as break through the Kasserine Pass in Tunisia. 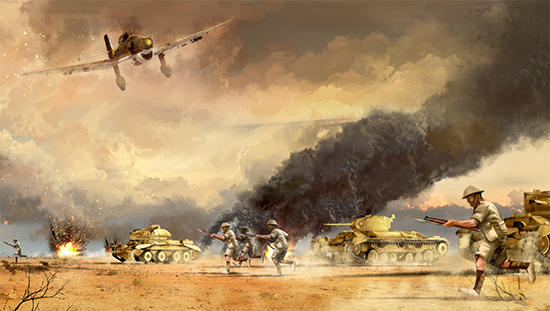 In the Allied campaign, take part in Operation Compass and retake the village of Sidi Barrani, relive the watershed of the Western Desert Campaign, the Second Battle of El Alamein, and break through the German defensive line in the Battle of Mareth. Fight in an unforgiving and harsh desert setting with sandstorms to challenge your tactical wits. Developed as a fully-fledged series entry and not a remake or reboot, Sudden Strike 4 sends you off on three extensive campaigns set amongst the battlefields of World War II. Commanding the British and American, German or Soviet armies, you will lead over 100 different units into battle, including the German Heinkel He111 bomber, the Russian T-34 tank, the British Hawker Typhoon fighter plane and even the notorious German Panzerkampfwagen VI “Tiger”. In a first for the Sudden Strike series, you can now choose from one of nine individual commanders, such as George Patton or Bernard Montgomery, whose unique military doctrines unlock valuable command and combat abilities for your troops. Prove your tactical expertise in over 20 demanding single-player scenarios, the challenge-focused skirmish mode, and the competitive multiplayer mode. A new reward system awards the player for clever play with skill points and bonus unlockable content. Sudden Strike 4 offers countless ways to vanquish your opponents. Exploit the weak spots of tanks, set up an ambush, occupy buildings with infantry and snipers, outmanoeuvre the enemy with clever positioning or unleash devastating air support – how you approach each mission is up to you! Africa – Desert War is available now for PC, Mac, Linux, for £6.99 €9.99 $9.99 and Xbox One and PlayStation 4 for £7.99 €9.99 $9.99 (PlayStation 4 following on 15th October). The Sudden Strike 4 base game is required to play.